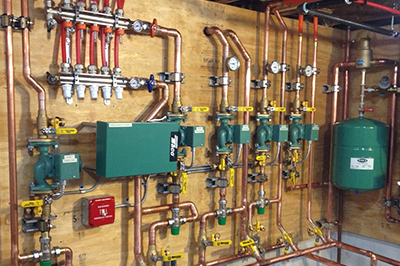 HYDRONIC HEATING – Senergy Mechanical Inc.
For optimal savings and comfort consider hydronic heating. Warming your house from the ground up provides ultimate comfort to you and your family. By running warm water underneath the floor through pipes, the floor warms and provides a comfortable warm atmosphere to the room. Compared to traditional methods of heating the house, hydronic heating is much more cost efficient, eco-friendly and convenient. Furnaces, fans and radiators make disruptive noise and can spread dust as the air blows throughout the house. Hydronic heating uses flowing water which is silent and does not start air flow. For this reason hydronic heating is the perfect option for people with allergies. Another benefit is the even heat distribution throughout the room. With furnace heating the hot air rises and heats the upper half of the room which is a waste of energy. Hydronic heating focuses on heating the lower half of the room, where people are. With the heat warming you from your feet up, your body with maintain a cozy warmth while your head will remain comfortably cooler because it will not get stuffy. Often times you have to blast the furnace to maintain the temperature as heat rises and escapes through doorways and open windows. By losing that hot air, you are losing money. With hydronic heating you will not be wasting any energy while lowering your electricity bill by up to 20% or 40%. Another way hydronic heating allows you to save is by giving you the convenience of choosing the temperature setting of every room. This makes focusing on heating high traffic areas much easier. Rooms with a lower visiting rate can be turned down to save energy while frequently used rooms can be turned up. Also places like entrance ways and basements can be set to a higher heat setting while the rest of the house can remain the same temperature. In other words, you have more control over where the heat goes. To provide you with the highest quality results we use only the best materials for our work. By using durable and efficient PEX-tubing we are confident you will love the outcome and comfort you will receive from your hydronic heating system. Our skilled and experienced professionals will be more than happy to help you anyday, so do not hesitate! For further questions or concerns feel free to contact us at (647)298-9247.